John Bosco was born on August 16, 1815 in the village of Becchi, close to Castelnuovo d’Asti (today Castelnuovo Don Bosco, northern Italy). His parents were poor farmers and his father died when he was only two years of age. His mother, Margarita, raised him with great difficulty but with great love. She taught him how to work and most importantly to recognize God in life’s fortunes and misfortunes. At the age of nine he had a very mysterious dream that would change his life forever. Both he and his mother understood the real meaning of that dream and so Margarita would later bear many sacrifices so that John’s dream of becoming a priest would be fulfilled. In 1841 as a young priest he came to work in Turin. His spiritual guide, Joseph Cafasso, gave him the following advice: “go throughout the city and observe how the people are living everyday life”. It was then that he saw human misery in all of its forms. The living standard of the workers was miserable and the youth were aimlessly wandering the city streets unemployed, lost and prone to crime and evil. His encounter with the juvenile delinquents had a great impact on him. He then made the decision to do all that he could to prevent the youth from getting into these tragic situations. Many of the priests at that time expected the youth, who swarmed into the city from the countryside, to find work and to come to church on their own. That was, however, very unlikely. A new way had to be developed that allowed one to contact the youth in the streets, town squares and cafes. Many priests, including Don Bosco, experimented with new methods to do this. On the feast of the Immaculate Conception, December 8, 1841, Don Bosco met Bartholomew Garelli from Asti, a young boy who came to Turin to find work. Three days later he brought along nine more friends and after three months there were twenty-five. By the summer of 1842 there were 80 boys. In short, that’s how the oratory began. One of the greatest problems that the boys encountered with city life was where to sleep. With time this became one of Don Bosco’s main preoccupations. His first benefactor was no aristocrat but rather his poor and illiterate mother Margarita. She left the peace and comfort of her village home and came to Turin to cook and clean for Don Bosco’s boys. Amongst the boys for whom Don Bosco was father and teacher, there were those who wanted to follow him. Hence, the beginning of the Salesian Society – The Society of St. Francis de Sales. In the autumn of 1853 the first workshops were opened in Valdocco with Don Bosco as the first teacher. The Salesian Society was officially recognized on January 20, 1854. Don Bosco’s first “volunteer”, Michael Rua, was ordained a priest July 30, 1860. 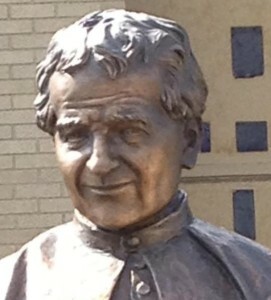 At the end of his life Don Bosco was able to say that over 3000 vocations came from his oratory. In March of 1864, the cornerstone of the Basilica of Mary, Help of Christians was laid in Valdocco. Eight years later Don Bosco began to build one more Marian “shrine” – the Daughters of Mary, Help of Christians. The greatest heritage that Don Bosco left the Church was his “preventive system” for the education of youth. When asked for the secret of his success, which transformed big institutions into a family of love, he answered with three words: reason, religion and kindness. When reasoning is used instead of threats, when God is the housemaster and when there is no fear but rather love, the end result is a true family. Don Bosco died at dawn on January 31, 1888. While on his deathbed, he whispered to his Salesians: “love each other as brothers. Do good to all and avoid evil..tell my boys that I am waiting for them in paradise.